It is that time of year again when many MyMac.com readers received new iPods for gifts. Last year I wrote Macspiration 18 and covered ways to troubleshoot your iPod. The iTunes/iPod world has changed a little in a year, so hear is Macspiration 68 updated for today’s iPods and iTunes. #1. Reset the ipod. Resetting the iPod will solve most of your problems, especially freezing. If you have any iPod model, except the shuffle, resetting the iPod is a matter of holding two buttons. Push and hold the MENU button while pressing the SELECT button (the round button in the middle of the click wheel) until the Apple logo appears on the iPod screen. This usually takes about ten seconds. Once the Apple logo appears, release the buttons, and the iPod will reboot. Sometimes, resetting the iPod while plugged into a power source (the computer or an outlet via the wall charger) will be needed for this method to be successful. #2. If resetting does no do the trick you might have to reinstall the iPod system software. You do this through iTunes. Connect your iPod and iTunes should open and the iPod will show up in the left hand column. Click the iPod. 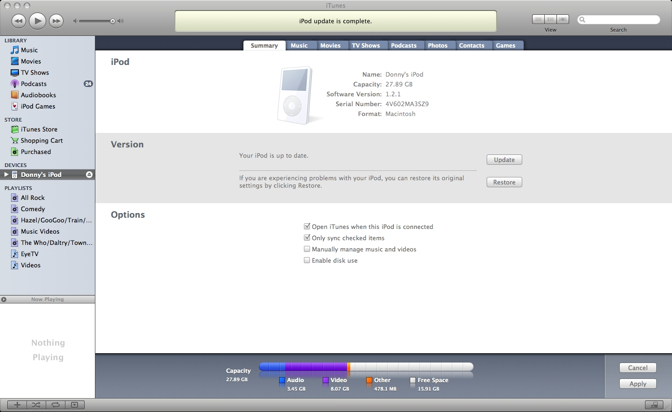 Make sure you are on the summary tab, and click “Restore.” If iTunes is not set to open when the iPod is connected, you’ll have to open iTunes manually. When the software is restored, the iPod will show the Apple logo on the screen and reboot. Once rebooted, you can reload you iPod. #3. Still not working right? Time to call Applecare or visit your local Apple Store. If you have a local Apple Store, I suggest going there for service. I have had nothing but good experiences at the Apple Store, and it is a lot faster than mailing the iPod in for service. If you do go to the Apple Store, make sure you make an appointment through Apple’s website.. Otherwise, you could be sitting around for a while waiting for a Genius to help you. Find the page for your local store here: http://www.apple.com/retail/. Have a Shuffle? Well, #2 and #3 from above will still work. You just won’t see the Shuffle reboot the same way (no display to show the logo). Watch for the green light on the Shuffle, and for the iPod’s icon to appear on your desktop to let you know it is finished rebooting. Resetting the shuffle is a little different. Basically, with the iPod off and disconnected from the computer wait five seconds, then turn the iPod back on. Not much, but worth trying. If you have a first generation Shuffle (the long white stick) you can use the new Reset Utility. Go here: http://www.apple.com/support/downloads/ipodshuffleresetutility101formac.html for more information. Hopefully, steps #1 and #2 will work and there will be no need for #3. Oh, and like last year, if you are so frustrated with your iPod that you want to through it out the window, don’t! I’ll be happy to take it off your hands- free of charge. Just send it to MyMac.com c/o Donny Yankellow. Leave your comments and questions below, or email me at Donny @ mymac.com.